My first Christmas Holiday in Denver was spent downhill skiing one day and golfing the next. I traveled back to the Midwest a few days later to bone chilling cold - 35 below, without the windchill. The idea of 'getting out of the house' meant going to the garage to bring the beer in so it didn't freeze. The Midwest winters mean you give up some things for many months at a time. This past winter in Chicago was brutal. I longed to grill something, anything... even grilled snow would have sufficed. Now the weather is reaching the 60's and we've been grilling for weeks. Grilling offers a fabulous way to make super simple salads while keeping the heat out of the house. 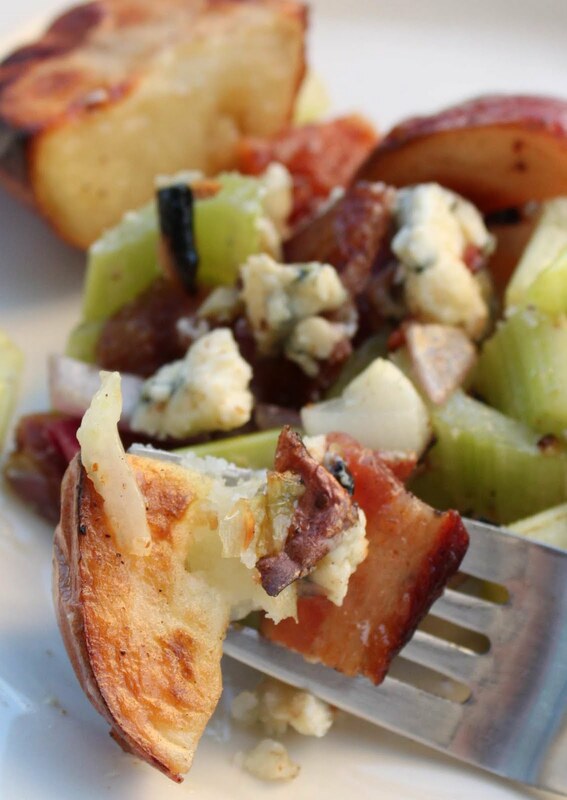 Warm grilled potatoes and onions begin to just melt the creamy blue cheese which mixes with the olive oil and creates its own sauce ... ah it's scrumptious! You won't be able to stop eating it. Put on your flip flops, celebrate the return of warm weather and master your salad-grilling skills. Now that's a reason to be fat and happy! Tips and Techniques: This salad is best when served warm. 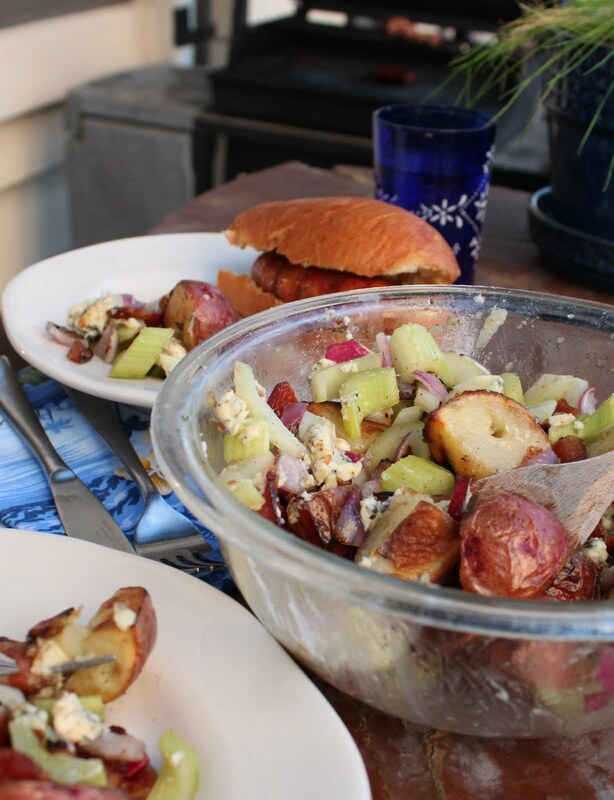 Plan the rest of your grilling around the potatoes. For a super tasty spread option, omit the potatoes and pulse the remaining ingredients together in a food processor. Scrub the potatoes, cut in half and toss in a bowl with 2 - 4Tbls olive oil and fresh ground pepper. Thread the potatoes on kabob skewers for easier handling on the grill. Add the garlic cloves on the skewers too. Place the skewers on the grill, cut side down, on the upper grate if you have one. Turning them once during cooking until just done, you want a firm cooked potato rather than a mushy one. Coat the red onion in the remaining olive oil, try to keep the onion together. Place this on the grill. Only grill for about 5 minutes to keep the onion crisp-tender, avoid overcooking. Cook the bacon on the grill by folding a little pan out of tinfoil, folding the edges up will keep the bacon grease from dripping into the grill and causing flare ups. Cook the bacon until desired crispiness. In the meantime, chop the celery (on the large side) and place back in the olive oil bowl. Remove the onion, chop, and add to the celery. Remove the bacon, let cool slightly, then chop or crumble into large pieces and add to the celery bowl. Sprinkle the cheese into the bowl. Dice up the garlic and add to the bowl. Add the potatoes to the bowl straight off the grill. Add lots of fresh ground black pepper and a pinch of salt. Toss. Serve immediately. This looks great! I'm going to make it as soon as the rain clears up and I can talk my friends into grilling out. But how much cheese? You say 1/2, but 1/2 of what? It is great. And good catch on the missing cheese amount. Start with 1/2 cup, toss and taste, if you like things really cheese, add a whole cup. You won't want much more than that - but really make it to your liking. I'm also a big pepper fan, so I use tons of fresh ground black pepper. The old saying I used at my restaurant was "grind until your arm hurts, the switch arms and grind some more!"